It's not too late to change my mind, let me state that right now as an absolute fact. I said the other day I was putting up The Sign of the Crumpled Bird, with the possibility that I'd then be having real world meetings with people around town. I've been sick ever since I said it, but you'll notice, I haven't deleted the post. I could be sick from anything. Look at me in Pocock's artwork, I don't know whether to dive in or throw up. That's truly how things stand. I like the looks of the tub. We didn't have a tub at hand, actually, when Pocock was sketching me. So he either drew it from memory of what tubs look like -- in which case I'm impressed -- or more likely he copied it from a tub catalog. It brings up an interesting thing in my mind about drawing circles. When you draw a circle from the side it becomes more of a football-shaped thing. Meaning, one could theorize, that if you looked at a football standing over it and looking down, it ought to be a circle. But it's not. That'd be a good thing to talk about in one of these real life meetings. Say I do put up the Sign of the Crumpled Bird, indicating I'm somewhere near at hand, in the vicinity, then I see a group of people milling around wondering if I'm going to show up. I edge in, let's also say, and peel off the most interesting looking guy from the periphery, and take him somewhat privately to get away from the crowd. Really, do I want a bunch of people who crowd in to see my sign, some guy who's close to it, like an investigator, trying to discern more about the author of the sign than he otherwise should? Or do I want the guy who's wondering but is more skeptical, even dismissive of the whole thing? Good question, huh? I believe I can confess it, I've always been something of a profiler, finicky, nit-picky, selective. That guy at the edge, he's more my cup of tea (or soup) than the closer guy, who barely gives me room to breathe. I need room to breathe, that's key. And if I need a quick escape, to get the hell out of there, I don't want the guy pressing in, breathing down my neck, but, hey, that's just me. Maybe the Crumpled Bird is a mistake, a bad idea. But I'm not giving up quite yet. No, I take that back, it's a great idea, separate the wheat from the chaff. I've always been good at that. I can be selective. The sign means I'm in the area, not that I'm necessarily going to swoop in and select someone. And I really feel for that guy at the edge. Maybe he's a real iconoclast. Just wants the crowd to disperse a bit so he can draw a mustache on my bird, or deface the sign in some other way, knowing it would very likely lure me out to choose him immediately on that account. Life is hard, ah yes, they used to teach us you can't win. But I'm sure you can win. If you really pay attention, read the signs that life puts out there, etc., etc. Life's own version of the Crumpled Bird. 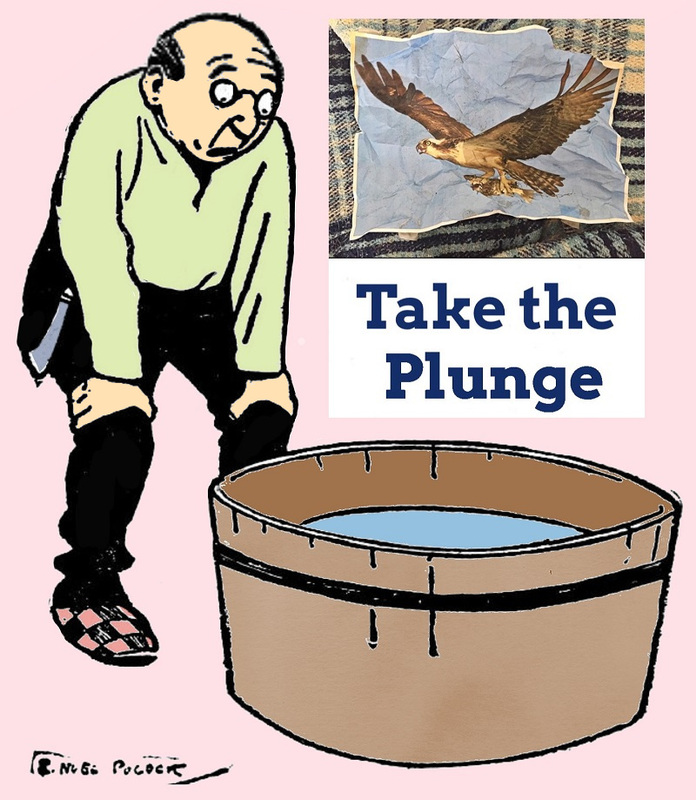 Gotta take that plunge! SPECIAL THANKS to E. Nubbi Pocock for today's artwork. I appreciate it very much, and the price was definitely right, zero. Thanks again. As an aside, though, no offense intended, If my pocock was nubbi I don't think I'd be parading around like E. did, making it my name! Am I right?